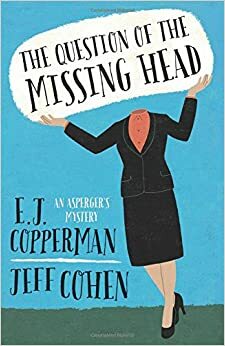 The Question of the Missing Head is the first in an unusual series of mysteries by E. J. Copperman and Jeff Cohen. What’s so unusual, you ask? It’s that the detective has Asperger’s Syndrome, which plays a significant role in the story. Perhaps this is the moment to point out that Adrian Monk of the television series Monk had obsessive-compulsive disorder, not an autism spectrum condition. This is not to say that there aren’t some overlaps between the two conditions, such as a need for predictability and consistency. As a point of contrast, Monk is pretty much comedic, whereas Hoenig is generally serious, though by no means without humor. Some find his characterization “unrealistic,” but there is such a wide spectrum of autism disorders even among those that used to be labeled Asperger’s that there’s no honest way to label one individual as atypical. Over my teaching career I’ve taught a fair number of students who are identified as autistic or Asperger’s (and quite a few who weren’t actually diagnosed but still clearly fit the bill); no two are alike. Anyway, The Question of the Missing Head is definitely worth reading. The Asperger’s theme is ever-present but does not dominate the story, which turns out to be a pretty good traditional mystery. Secondary characters are well handled, including the ubiquitous sidekick (as well as the detective’s mother, in a not-so-typical twist). The “missing head” in question, by the way, is the head of a client for a cryonics institute — a client who has had her head frozen in the hope that it can be revived at some time in the far (or, better yet, not so far) future. Implausible, yes, but anything can happen in New Jersey. Now I’m going to read the second book in the series. ‹ What’s wrong with periods?